You cannot be told what the Broforce is... You have to see it for yourself. Bropheus knows what he's on about, but we're going to take a stab at explaining it anyway. Created by the indie studio Free Lives, Broforce is a sidescrolling co-op shooter a la Contra or Metal Slug, putting you and three other players into the most realistic patriotism simulation ever conceived. In Broforce you play as 80s/90s action heroes waging war on terror throughout settings that are almost entirely destructible. Playable bros are upgradeable and come with distinctive attacks and special abilities, all perfectly usable for coating the walls with terrorist blood. It's an action-fest for sure, but the inclusion of stealth, strategy, customization features and four player online and local co-op makes it more than just a simple run and gun game. Broforce was Greenlit by the Steam community in July, and pre-orders are currently available, granting you access to the beta version in exchange for your patriotic coinage. The money goes finishing the game, defeating terrorism, and buying the dev team gold-plated jacuzzis. All good causes for the betterment of the world. You can check out the old browser Brototype if you're in the mood. 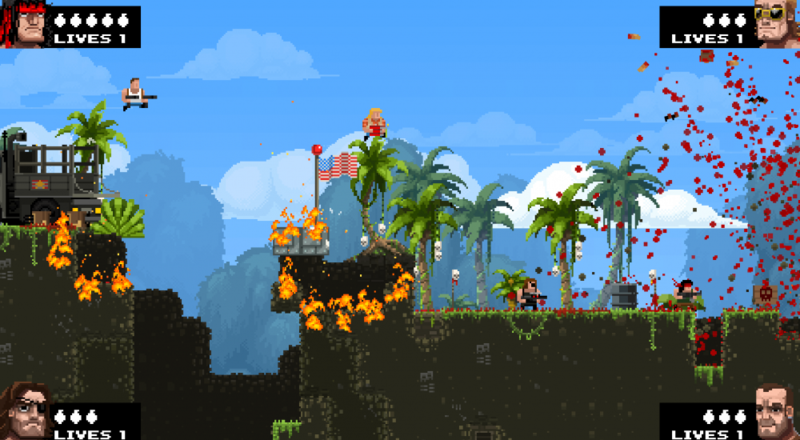 Broforce will release for Windows, Mac and Linux with support for six player co-op. PlayStation 3 and PS Vita versions are also planned. And remember: for every terrorist killed in Broforce, a real life terrorist will die.